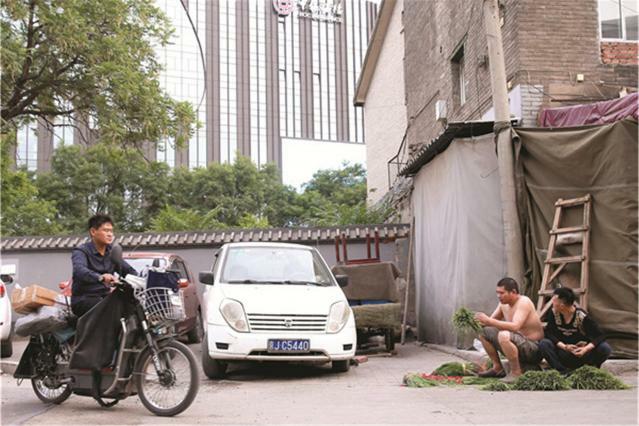 He Huizhong has just finished shopping for fresh vegetables at a farmer's market in a narrow alleyway in central Beijing that's too small for a car to pass through. On the short walk home, the 68-year-old looks up, as he always does, to the 51-meter-tall Tibetan Buddhist pagoda that gleams white in the sunshine. "Somehow, it makes me feel secure in this big city that changes every day," he said. He has been living in a hutong, or alleyway home, in the Baitasi (white pagoda temple) area of Beijing's Xicheng district for more than 50 years. The pagoda has watched over the neighborhood for 737 years. As Beijing grows ever larger and is packed more and more tightly with towering modern skyscrapers, the number of hutong neighborhoods such as his, which first appeared in the city more than 700 years ago during the Yuan Dynasty (1368-1644), has been falling. According to the latest figures from the Xicheng branch of the Beijing Municipal Commission of Urban Planning, the district had 858 hutong in 2003 and is currently thought to have around 609. Citywide, the latest official tally was released in 2005. At that time, there were 1,353 hutong in Old Beijing. The survey counted hutong — which are collections of closely packed ground-level homes organized in distinctive patterns around narrow alleyways — within the Old City of Beijing, which is a 62.5 square kilometer area encircled by the city's Second Ring Road. The road stands today where the original city wall once stood. Wang Fei, deputy director of the Beijing Municipal Commission of Urban Planning, said recently that the city will protect the "more than 1,000 existing hutong" that remain and that their names will also be preserved. Wang did not give a specific number for how many hutong are left within the boundaries of the old city wall and no one from the commission could be reached for comment when contacted by China Daily. Experts said improved legislation and greater public awareness of the importance of the disappearing hutong areas have slowed the rate at which they and the city's siheyuan (traditional quadrangle courtyards) are being cleared. Many people now see the traditional architecture of these neighborhoods as the essence of Beijing as an ancient imperial city with a long history. But, even today, some hutong are still being torn down. And a range of issues plague the remaining hutong areas, including disputed property rights, unpleasant living conditions and the unreasonable commercialization of some of these existing homes and alleyways. Nanluoguxiang, a 740-year-old hutong in Beijing, has become a popular destination for tourists. While no updated official data is available for the situation right now, non-governmental organizations are conducting their own research. The Beijing Cultural Heritage Protection Center, one such non-governmental organization, is conducting surveys of all the remaining hutong within the Old City area. The CHP is being helped in its work by an army of 160 volunteers. According to Zhang Pei, the project manager, some of the hutong that were recorded and surveyed in 2005 have since been demolished. "Three of the 10 hutong I visited have disappeared and one is under demolition," said Liu Huiting, 36, a volunteer who helped survey the ancient homes in the Xisi area. Fengsheng Hutong, where Liu lived before she married, is now partially demolished. Liu, who is a teacher of Chinese at a senior high school, asked her students to visit the former homes and neighborhoods of historical figures during their winter vacations. "Some students returned after the holidays and told me that some of the houses mentioned in the textbooks had gone, along with the hutong around them," she said. While up-to-date numbers are sketchy, what we do know is the number of hutong in the Old City area almost halved between 1990 and 2005, when the total fell from 2,242 to 1,353, according to official data. The loss during those 15 years was heavier than the total destroyed during the 40 years from 1949 to 1989. Much of the drive to redevelop hutong areas in the past has been inspired by a desire to improve the physical living conditions of the residents, because it is common in hutong areas for people to live in homes with inefficient and polluting heating systems, poor sanitation and water supply and shared public toilets. Despite the drawbacks, many people who live in hutong areas enjoy living in a central location and dislike the fact that redevelopment projects often lead to hutong residents from central Beijing being relocated to new high-rises in the suburban areas beyond the Fifth Ring Road. 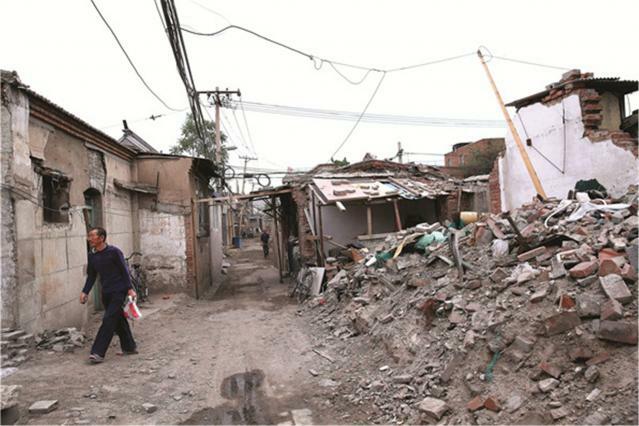 In spite of the arguments both for and against the demolition and redevelopment of hutong areas, there is no denying the demolitions of the hutong and the resulting land sales, have been lucrative and a major source of revenue for local governments in Beijing. According to a China Business News report, revenues from municipal land sales in Beijing last year reached a record high of 198.4 billion yuan ($30.2 billion), which was more than half of the capital's yearly fiscal revenue. Dongxiejie Hutong is just a street away from Beijing’s financial district, but people living in the hutong feel as if they are in a totally different world to those in the high-rises. In early 2005, the "Overall Urban Planning of Beijing 2005-2020" was approved by the State Council, China's cabinet. For the first time, an official paper set the "integral protection of the Old City of Beijing" as a principle, with the goal of "protecting the hutong-siheyuan traditional architecture style". However, only 46 percent of the 1,353 hutong in existence in 2005 were within the city's conservation districts pertaining to historic sites validated within the "2005-2020" plan and others remained outside and vulnerable to demolition. "It is not truly integral protection if you allow part of the Old City to be removed," said Hoa Hsinmin, who is better known in China as Hua Xinmin and who is one of the most well known defenders of the hutong neighborhoods. "You can't say this piece of cake is good and then say part of it is edible while the rest is not. It's ridiculous," said Hua, who has French and Chinese ancestry but considers herself to be Chinese culturally. Born in Beijing in 1954, she lived in the city until she was 22 when she moved to France. She returned in 1997 and was shocked to find "demolition was taking place every where". Hua, the daughter of Leon Hoa, who was chief architect at the Beijing Institute of Architectural Design during the 1950s, became a dedicated protector of the capital's hutong, submitting suggestions to the government, writing books and essays and giving lectures about hutong. According to Feng Feifei, head of the urban design department at the Beijing Municipal Institute of City Planning and Design, the hutong are not entirely safe, even if they are within the conservation area because it has been divided into a "highly protected zone" and a "controlled construction zone". Old buildings in the second zone are therefore potential candidates for destruction and distortion, Feng said. She and her colleagues proposed getting rid of the "controlled construction zone" in a detailed planning follow-up to the 2005-2020 plan, but the idea was not sanctioned by the municipal government, she said. "Ideally, all the hutong will be kept as they are an integral part of the Old City and once they are gone, they are gone for good. But it is always a process of conflicts and compromise," Feng said. "When economic growth is the top priority and Gross Domestic Product is taken as the major indicator of an official's performance, it is not surprising that something like Oriental Plaza could have been built so close to the city center back then. She was referring to one of Asia's largest developments of shopping malls, office buildings and hotels, which is located only 1 kilometer east of the Forbidden City, the Chinese imperial palace for five centuries. The plaza started operation in 2000. In the short term, the protection and preservation of hutong is certainly not profitable as opposed to the sale of the land they stand on, especially when protecting and renovating hutong areas requires significant investment, she explained. However, the hutong do have intrinsic value and calculations about their worth change in the long run. "The preservation of hutong raises the value of the entire area and the city," she said. "It takes vision to do the correct cost-profit analysis." Near to He Huizhong's house stands the famous courtyard where Lu Xun, a leading figure in modern Chinese literature, used to live and where Lu completed many well-known works. According to his book, Lu who died in 1936, also enjoyed looking up at the pagoda that today so captivates He. One street away lies the financial district known as Beijing's Wall Street where people in suits meet in five-star hotels and where China's top banks have their headquarters. While He likes his neighborhood farmers' market, people can also choose to buy their vegetables from supermarkets packed with imported goods. "Before the financial street had its facelift, it was just like Baitasi. Large numbers of buildings were demolished and people were relocated to apartment blocks," He said. "Now Baitasi is like its poor brother. I always wonder what people think of us when they stand in the tall buildings across the street." He and his wife live in an 18-square-meter home built by his father within the front yard of a courtyard once owned by a prestigious family. Today, the courtyard is home to six families and many of the classic architectural features are long gone. It is easy to tell how many families share such courtyards; all you need to do is count how many electricity meters hang next to the shared entranceway. "Protecting the Old City of Beijing is much more complicated and challenging than protecting a porcelain vase from the Song Dynasty (960-1279). It is a vast and constantly transforming area where people live and work," said He Shuzhong, the founder of the CHP. On one hand, as cultural icons of Beijing, a few hutong have become so popular with tourists that local residents find all the attention too much and preservationists worry about the potential risk to historic buildings from the massive crowds. 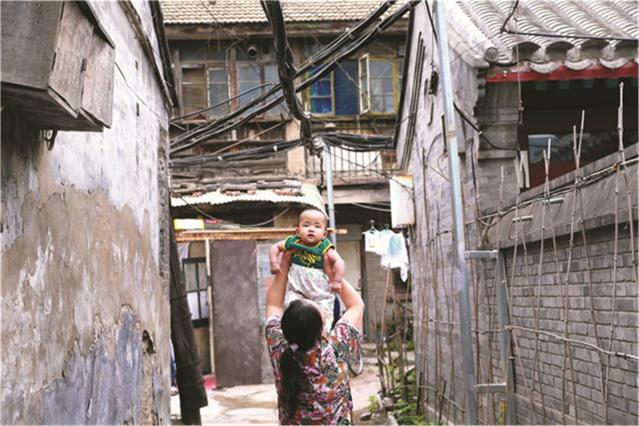 But on the other hand, most hutong residents live in less popular and well known neighborhoods and have their own challenges to deal with that include cramped living conditions and shared bathrooms. 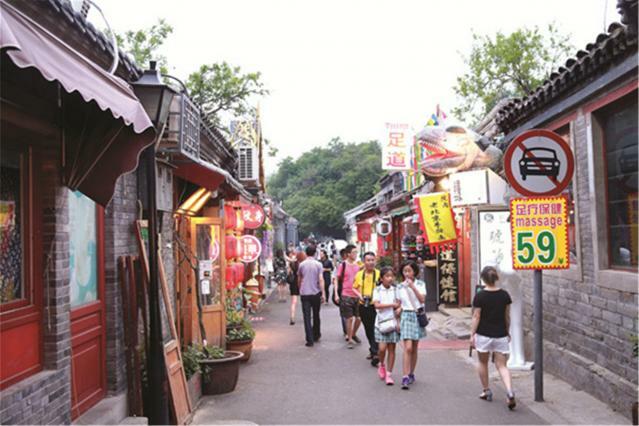 In response to the challenges facing one popular hutong area, the local government in Dongcheng district issued a ban in April on large tour groups visiting Nanluoguxiang, a 740-year-old hutong that is lined with shops, restaurants and bars. "Many outsiders urge the government to protect hutong because they see them as historical sites but many people living in them actually want to move out because they see them as old and dangerous houses," said Hu Xinyu from the CHP who is also co-founder of the Courtyard Institute, an alternative educational institution dedicated to promoting traditional culture. Hu, a Beijing native, said the renovation of hutong areas still present far bigger challenges for governments at all levels than their demolition. "Currently, different parties including the government, architects and the city planners are carrying out research into hutong renovation projects," Hu said. "It is hard to tell what hutong will be like in the future, but one thing for sure is that the best way to preserve hutong is to improve the lives of the people who live in them." However, Hua Xinmin is not so concerned about how best to renovate the aging, poorly equipped homes. She is more worried about who rightfully owns them. "No matter how fancy the decoration might look, it is fundamentally wrong if the owners of the homes are not involved in the decision-making process," she said. Hua refers back to the early 1950s, when many residents moved to the city for work following the nationalization of private enterprises. The situation is described in Old City Planning, a book by Feng Feifei. To solve the housing problem, according to the standard in Beijing at the time, families with more than 15 rooms or 225 square meters of space in total, were asked to give the leasing rights of additional rooms to local governments so they could be rented out. The homeowners were then given one-third of the rent collected from those surplus rooms. The exercise involved around 230,000 rooms and 6,000 households. Then, during the "cultural revolution" (1966-76), many of the house owners were forced to hand their property deeds to the Red Guards — students and young people mobilized to implement the goals of the "cultural revolution" — or reluctantly accepted other incentives in return for the ownership documents. While houses have been returned to the original owners in many cities that had similar issues, many property owners in the capital are still struggling to get their houses back and remain tenants instead of owners. "The more I'm involved in the work, the more I realize that property rights are at the heart of the hutong protection issue. Without the respect of property rights, the protection of the Old City is groundless," Hua said. When the CHP was founded in 2003, they decided the slogan they wanted to use was "Help the community residents protect their own cultural heritage", which He Shuzhong still takes great pride in today. "Protection of the Old City of Beijing is essentially about the rule of law — is the existing law being fully implemented and do the residents have a say in the decision-making process? " He said. "Each of these question is bigger than the protection issue itself and the protection won't be successful without their progress." He said he is pleased to witness the growing awareness of the hutong issue among the public, which will be the fundamental driving force of change in the long run. "I still remember, in the beginning we only had a couple of people in the audience attending our lectures and now we have many more and so many volunteers helping us on this project," he said. Feng from the Beijing Municipal Institute of City Planning and Design, which is part of the Beijing Municipal Commission of Urban Planning, said society as a whole is playing a much larger role in the protection of historic neighborhoods. "In the past, the government bodies and NGOs tended to look at each other with suspicion, but now we are building trust and can cooperate in some cases," Feng said. Today, the Baitasi area which surrounds the white pagoda is part of the most protected conservation zone, and hutong there must not be demolished. Instead, more than 900 courtyards in the area are being renovated. Residents such as He can choose whether they want to carry on living in the renovated homes or opt for resettlement. Many people have decided to move into the suburban apartments on offer after receiving compensation from the government. They also like the idea of no longer needing to use public toilets and being able to park their cars more easily. Homes that stand empty awaiting renovation and, in many cases new tenants, are wrapped in red plastic paper with the silhouettes of the white pagoda and skyscrapers printed on them and the words "Capture the opportunities and fulfill the dream of settling down". He said he is now seeing more and more of these "wrapping paper" houses in the neighborhood, but he has no intention of being among those who are leaving. "As soon as I get into my hutong, the noise of the big city disappears, and having my feet steady on the ground is a good feeling that people who live in tall buildings cannot understand."